Folic acid alomg with methylcobalamin lowers the homocysteine level thereby reducing risk of heart disease,smoke and other vascular diseases. Optimal Vit B12, folic acid status during pregnancy helps prevent neural tube defects. A combination that offers beneficial effects in somatic symptoms like pain and paresthesia. 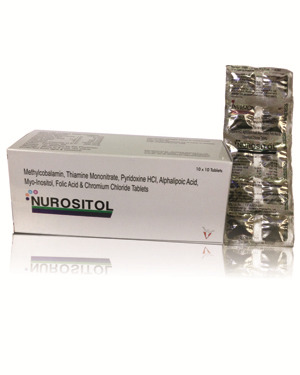 A trusted therapy against painful diabetic neuropathy. Improves sensory & major symptoms in restless leg syndrome. Improves reaction time,enhances mental agility and increase learning ability. Offers regression from signs of neuropathy. Prevents cellular damage,improves nerve conduction. Ensures better regeneration of nerve cells. Provides protection from damage due to free radicals. Regulates cell function,improves nerve transmission. Reduces elevated levels of homocysteine.